Failed Republican presidential candidate and disgraced former Speaker of the House Newt Gingrich is known for his deep thoughts, and he’ll share them with you at bargain-basement rates. 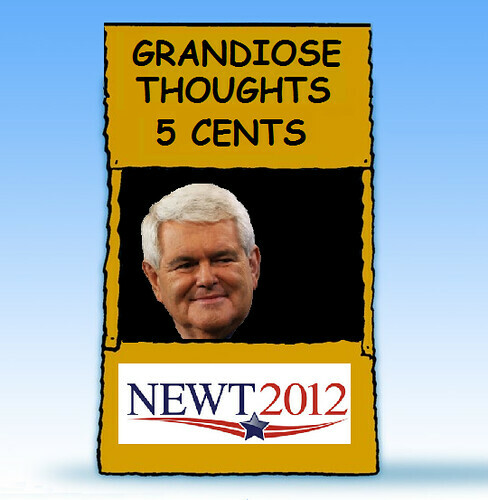 Mr. Gingrich has cut his speaking fees from $60,000 to $25,000. Earlier this year the health care policy think tank he founded declared bankruptcy. “While health-care costs have bankrupted many without insurance, Gingrich may be the first to go broke studying health-care delivery,” observed University of Georgia professor Charles S. Bullock III. Mr. Gingrich’s other think tank, American Solutions for Winning the Future, shut down last year. It’s almost enough to make you believe the Invisible Hand of the Market belongs to a just God. This entry was posted on June 14, 2012 at 9:00 am and is filed under business, economics, Republicans. You can follow any responses to this entry through the RSS 2.0 feed. You can leave a response, or trackback from your own site.